Across the American West, indigenous tribes are grappling with the dilemma of balancing development of energy resources on their ancestral homelands with sustaining their traditional beliefs of respect and care for the Earth. Previously the victims of environmental degradation and federal mismanagement, Native people are in the midst of an extraordinary resurgence within the current, controversial, energy and climate change debate. Many tribes are challenging long-held stereotypes, asserting their sovereign rights to control their lands, and implementing strategies to develop their natural and mineral resources without further disrupting their environment. As microcosms of conflicts between progress and tradition, between the material needs of today and the potentially negative consequences of tomorrow, American Indian reservations hold ten percent of potential renewable energy, 20 percent of known oil and gas reserves, and 30 percent of the coal reserves in the United States west of the Mississippi River. As demands for energy increase, so does the pursuit of untapped resources, both below and above the ground. Among Washington coastal tribes, the Lummi Nation has victoriously opposed the massive Gateway Pacific coal train and export terminal at Cherry Point, while the Swinomish Indian tribal community has successfully resisted a Shell oil-by-rail unloading facility at an Anacortes refinery. Both tribes have effectively stopped proposed fossil fuel projects through legal challenges protecting their treaty rights and with supportive community participation in public processes, rallies, marches, rail blockades, and intertribal networking. But the litigation and direct actions of the Standing Rock Sioux Tribe and allies continue, through efforts to protect their water and land for future generations from Dakota Access pipeline construction and operation impacts. Tunneling from North Dakota through South Dakota and Iowa to Illinois, this Bakken oil pipeline would cross under the Missouri River upstream of their reservation in North Dakota, polluting their drinking water sources and threatening their burial grounds and sacred sites. Symbolizing the ongoing Native struggle between tradition and progress, this fossil fuel project has galvanized thousands of Indians from over 200 tribes to gather with the Standing Rock Sioux in peaceful and prayerful resistance along the pipeline route near the Cannonball River. Sponsored by the Idaho Mythweaver and Wild Idaho Rising Tide (WIRT), a public screening of the new documentary Red Power Energy and an indigenous-led discussion of Dakota Access pipeline opposition together serve as a fundraiser for the Standing Rock Sioux legal defense fund, with suggested theater admission donations of $5 or more. 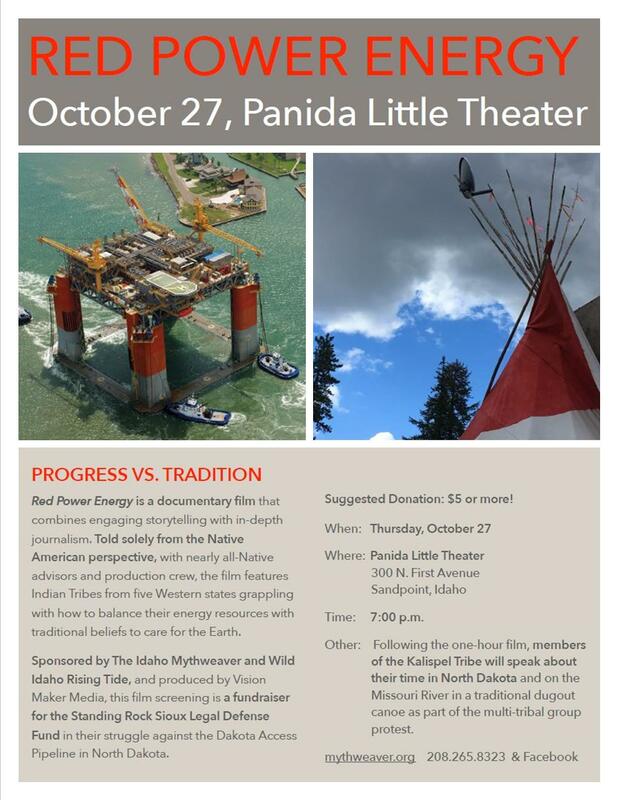 Immediately after the one-hour film, showing at 7 pm on Thursday, October 27, at the Little Panida Theater (300 North First Avenue, Sandpoint, Idaho), members of the Kalispel Tribe of Indians will speak about their participation in the Standing Rock convergence and in a multi-tribal protest where they paddled their traditional dugout canoe on the Missouri River from Bismarck, North Dakota, to the Cannonball River confluence. Provocative, timely, and unique, Red Power Energy offers rare glimpses and insights into the ideological battles shaping Indian Country, while advancing a deeper understanding of energy issues. An original production of Vision Maker Media and Rocky Mountain Public Broadcasting Service, the movie combines engaging, first-person storytelling with in-depth journalism, illustrating the complex realities of energy development and resistance empowering Native tribes. Told solely from the Native perspective, with a nearly all-Native film crew and advisory council, the documentary features American Indian tribes in Colorado, Montana, North Dakota, South Dakota, and Wyoming. Please support and stand with Standing Rock and allied Dakota Access pipeline opposition by attending this upcoming, grassroots event and by sharing its email, facebook, website, and flyer (red-power-energy-flyer) announcements with your friends and family. Invite and bring them to the 80-seat Little Panida Theater in Sandpoint, which we hope to fill with an enthusiastic audience at 7 pm on Thursday evening, October 27. For further event and issue information, contact WIRT or the Idaho Mythweaver director Jane Fritz at janefritz@frontier.com, 208-265-8323, Mythweaver.org, or facebook.com/idahomythweaver. Thanks! Water is life!